Zen Master Thich Nhat Hanh is a Vietnamese Buddhist monk and peace activist. He founded Parallax Press and has published more than 100 books. Many of them are the best mindfulness and Buddhism books in the market. In 1967, Martin Luther King nominated him for the Nobel Peace Prize. Often referred to as “thay” (teacher) by his followers, his books and poems are short yet insightful. You might not be looking for anything in particular, but pick up one of his books. Just reading his writings will make you feel calm and remind you that you are here. Below you will find the 10 of his best works and a short quote from each book. Some of them are Thich Nhat Hanh’s best selling books, while others focus on specific topics of mindful living. Choose one that resonates with you. In this book, Thich Nhat Hanh shares his insights on interdependence. Your action and your state of being affect everyone around you. If you are peaceful, your family, friends, and the society will benefit from your peace. If you feel disconnected with the world or feel affected by the conflicts, this book is great for you. Not only does it helps you to be present and enjoy the moment, it helps you understand your part in creating a more peaceful world. This book is a reminder that we are alive in this present moment. It encourages us to focus our attention on the little things in life and be grateful for them. If you are new to Thich Nhat Hanh’s teachings and want a taste of his writing, read his books from the Mindfulness Essentials Series. Seemingly simple yet insightful. The series consists of five bite-sized, easy-digestible books that teach you how to love, sit, walk, eat, and relax mindfully. The latest addition to the series is a book on how to fight. It teaches you how to relax your anger. Having only one insight per page, these books are great for meditation too. You can read each short paragraph and take a moment to pause and reflect on the wisdom shared. Use these books to help you live a mindful life. Originally written in Vietnamese as a long letter to encourage his colleagues and friends during a crisis, this book is personal and direct. This book is a great introduction to the practice of mindfulness meditation. It contains a good balance of memorable anecdotes and practical exercises that will help you be mindful in different situations. If you are new to mindfulness and want to learn how it can calm you down in your daily life, this book is for you. The instructions on how to meditate are short and simple enough for any beginners to follow. And you don’t need anything else to practice the teaching, except your breath. Are you successful, rich yet unhappy? Do you neglect yourself and your loved ones to achieve the success you desire? If so, read this book. Society’s definition of power is very limited. Most of us seek wealth, personal success, and fame to gain power and control of our life. But sometimes, we get so obsessed with our goals and dreams that it strains and drains our relationships. Is that worth it? In this book, Thich Nhat Hanh introduces a greater power — our spiritual power. The power that allows us to be happy right at the moment. Having financial wealth and success without happiness is pointless. You can have both profit and compassion. This book is suitable for anyone who feels lost in their pursuit of power and wants a more fulfilling life. Are you often dissatisfied with your relationships? If so, this is the book for you. Most of us want to love another and be loved in return. But many times, we feel frustrated by the lack of appreciation and attention for our efforts. This book has a different take on love. True love is simply being there for the other. It’s about recognizing the presence of the other. Instead of focusing too much on ourselves and being right, you overcome your pride and listen with an open mind. By being mindful of both yourself and the other, you will understand the other. And when there’s understanding, love will naturally emerge. This book will help you and your partner be more loving in your everyday lives. This book teaches you to communicate and tell the truth with compassion and mindfulness. Communication with others starts with communication with yourself. If you are able to understand your own suffering, you are able to recognize the suffering of the other person and naturally compassion arises. Thich Nhat Hanh provides six mantras that can help you correct your inaccurate perceptions of others. If you want to connect with others meaningfully, this is definitely the book to read. The Buddha is in all of us. Buddha’s teaching involves recognizing and acknowledging our own suffering. It’s about freeing ourselves from our pain. And all of us can do it. This book serves as a guide for transforming your suffering into peace and joy. It covers significant Buddhist teachings such as The Four Noble Truths and The Noble Eightfold Path. This book is suitable for people who are interested in Buddhist teachings. We can’t be free and happy unless we let go of our anger and anxiety. If you are someone who still holds on to your hurt feelings, this book will help you find relief. If you want to know more about Thich Nhat Hanh’s life as a Buddhist monk and his spiritual journey, this autobiographical book is for you. In this book, you will find many inspiring stories from his childhood and the traditions of rural Vietnam. Arranged in chronological order, each section will take you to a time in his life where Thich Nhat Hanh shares the important lessons he has learned. 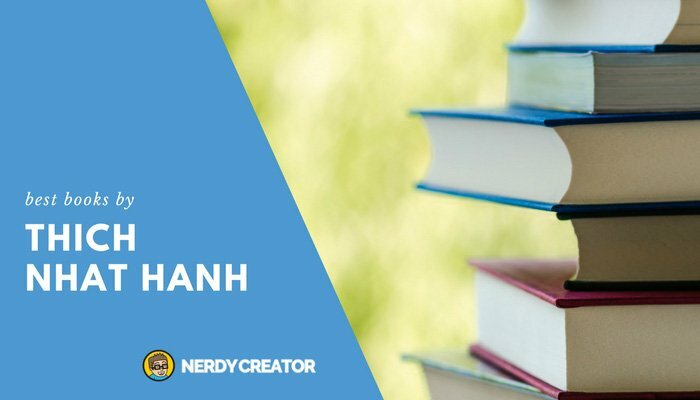 This book is suitable for Thich Nhat Hanh’s followers or someone who loves learning through stories and other people’s reflections. If you are a parent or a teacher, this children’s book is a great way for you to teach meditation to your kids and students. In this book, Thich Nhat Hanh helps children deal with difficult emotions using the pebble meditation. Not only is the meditation fun and a wonderful way to spend time with your kids, it also allows your kids to be hands-on and connect with nature. Initially, it is best to read and do the meditation together with your kids. But once you have taught your kids the pebble meditation, it is simple enough for them to do it on their own.